Sorli's House is a one room, stone house and the home of Sorli the Builder, Pactur, and their son Sirgar. It is the only house in Stonehills. It is situated by Stonehills encampment and Rockwallow mine which is run by Pactur and Sorli for Thane Bryling in Solitude, all the citizens of Stonehills including their son Sirgar work in the iron ore mine. There is a small deck in front of the house with a wooden bench at one end and a pile of firewood at the other. There is an unusually high number of blue butterflies and butterflies around the house and encampment. Inside it is a one room home. On your left upon entering is a cupboard holding nine iron ingots, a potion of minor healing, a potion of stamina, a potion of true shot and an iron sword. To the right is a food barrel. Against the east wall is a long wooden table holding four pieces of iron ore, a bottle of alto wine, a bottle of wine, a pickaxe and nine iron ingots, with two more on the floor under and beside the table. 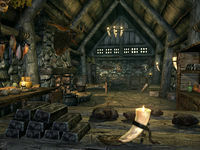 There is a second pickaxe leaning against the wall to the right of the table with two garlic braids, a bunch of elves ear and a bunch of frost mirriam hanging from the ceiling above. Against the south wall is another long wooden table and chair, this is where Sorli spends a lot of her time. On the table are two bottles of alto wine, a bottle of wine, several loaves of bread, two potatoes, several pieces of cheese, a seared slaughterfish and a salmon steak. Above this table are three hanging racks holding four rabbits, four pheasants and two salmon. In the center of the south wall, opposite the door is a fireplace with a cooking pot in front. On the mantlepiece is a bowl of troll fat and a copy of the Speech skill book 2920, Second Seed, v5. To the right of the fireplace, coming out from the south wall is Sirgar's single unowned bed an to the right of this is a cupboard with three bunches of elves ear and two bunches of frost mirriam hanging from the ceiling above it. Coming out from the west wall is a large double bed where Sorli and Pactur sleep, there is an end table to the left holding a bottle alto wine and a bottle of wine. To the right of the bed is a dresser containing clothes. Against the north wall is an unlocked chest containing minor loot with a round table and chair beside this holding a bottle of wine, a loaf of bread and a pine thrush egg. There are four more pine thrush egg in a basket on the floor. Beside the table is a pile of firewood and a woodcutter's axe. 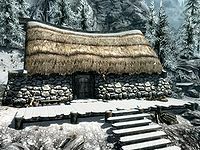 If the Stormcloaks take over Hjaalmarch, they are all supposed to moved to Highmoon Hall. Pactur who is supposed to act as steward judging from his dialogue and faction. However, due to an oversight, Pactur stays in Stonehills. This is fixed by the Hearthfire add-on.